Brugge / Bruges would have an eternal special place in my heart forever and ever! This was the first trip outside of Brussels and first stay at a place other than home for Atyudarini. I was extremely flustered about all things that could possibly go wrong, but it was relatively OK. Unlike my earlier trips where my itinerary would be jam packed, this time it was slowpaced and included getting back to the room for atleast an hour during noon for Atyu to sleep! 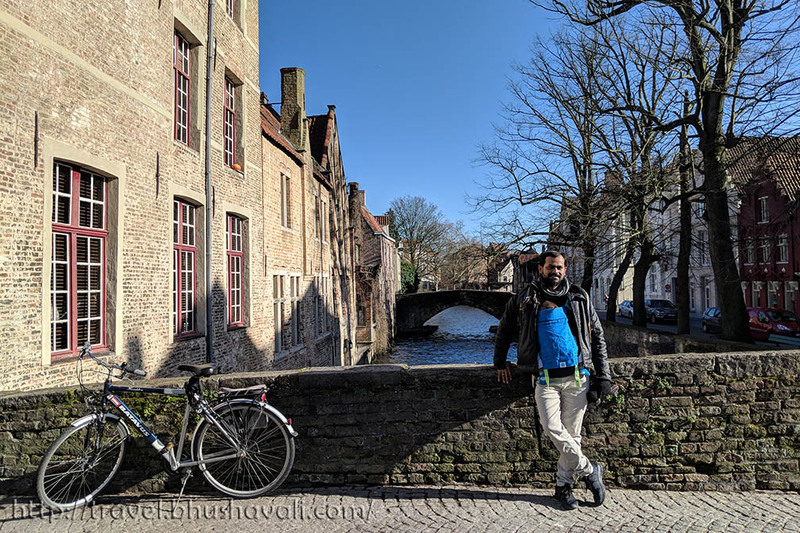 The entire city of Brugge is listed under UNESCO as Historic City Centre just like its counterparts in Ahmedabad, Florence, Bath etc. The centre point is ofcourse the Belfry and TownHall and the whole city around it. It is possible to visit the Townhall as well, however I chose to miss it. Just beside the Townhall is the Basilica of Holy Blood. This place is called the Burg Square and in the way from Belfry to here is the most important place - Chez Albert Waffles. Its just divine, perhaps the best waffle I've ever tasted so far. Just beside the Belfry is the Salvador Dali expo which I sadly missed though Dali is one of my fav artists. 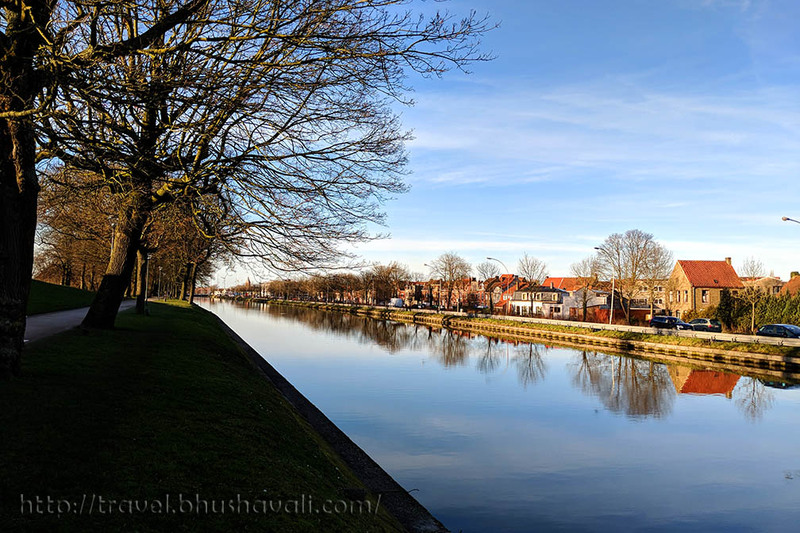 From there a short walk took me Rozenhoedkaai which immediately reminded me of Graslei & Korenlei of Ghent. Its just so picturesque and probably because we were there on a weekday in winter, it hardly had any of the touristic crowd! 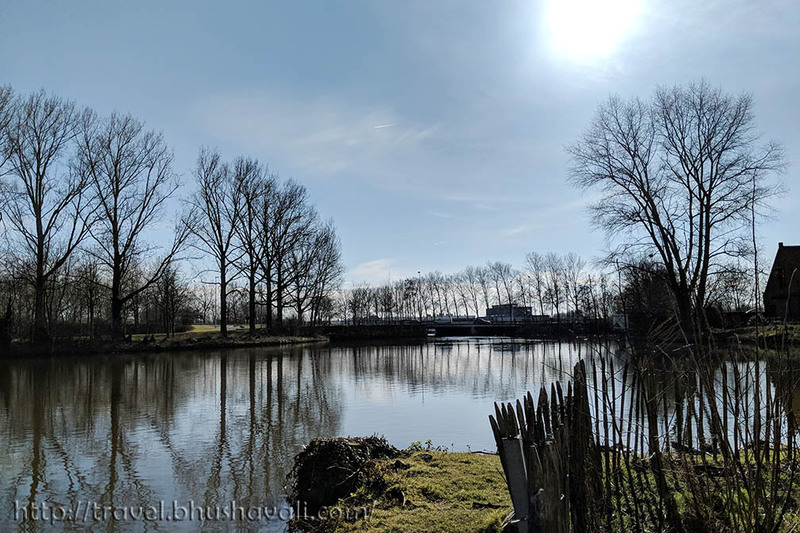 As I was told "Lose the map and explore Bruges", I gave up on the map and started to walk where my legs took me and ended up in Kon Astrid (Queen Astrid) Park. It was sunny and Atyudarini got to see ducks for the first time and took some sun bath as well! 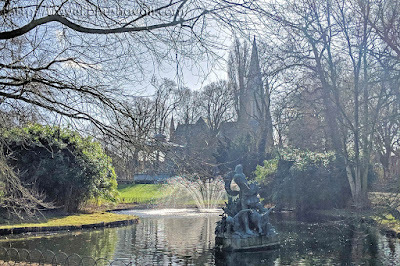 In this garden is also a Church of Mary Magdelene and Saint Catherine. By afternoon we headed to Sint Annakerk & Jeruzalemkerk and by sunset we were at Kruisvest where 4 traditional windmills are located along the canal. 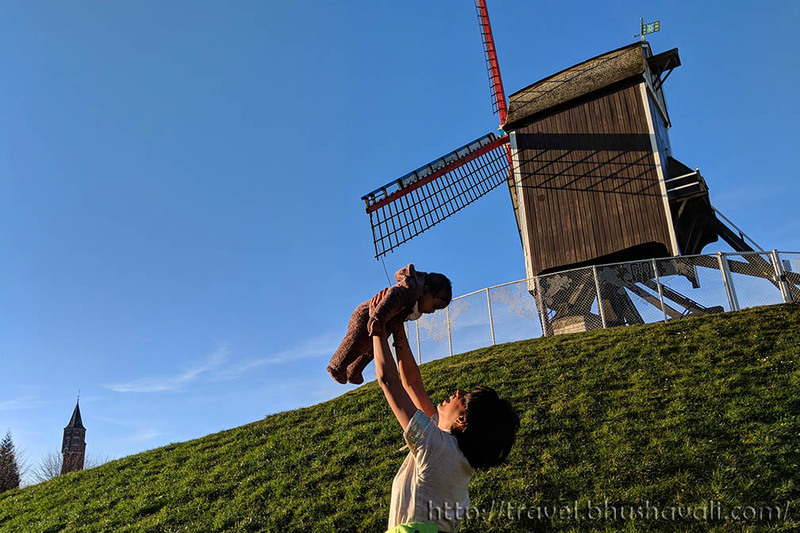 Somehow I missed to see a traditional windmill both in London & Amsterdam and I was pretty much bummed about it and here I was in front of one with my Atyu! The first in the line is Bonne Chieremolen which can only be seen from outside, followed by Sint-Janshuismolen (St.John's House Mill). This has been converted into a museum. But sadly this was closed for renovation when I went. But still, I got to see traditional windmills!!! It is till this point, bordering along these mills, the UNESCO Heritage City's boundary lies. Following these 2 are 2 more mills, but by this time, it started get colder and Atyu began to cry and we skipped the 2. Pretty close to the 4th mill is the OLV-ter Potterie Church. This houses some statues or paintings of the 13th & 14th C CE. In the opposite direction, very close to city centre are Groeninge Museum, Arenthuis & Arent's Courtyard. The connection between Groeninge Museum and OLV Church (OLV-ter potterie is a different church! 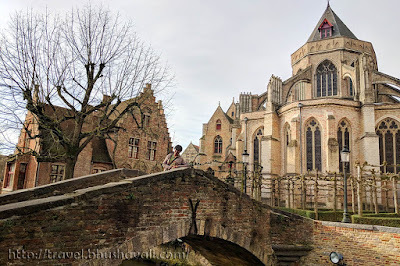 ), is gorgeous little bridge which is actually one of the most romantic places in Brugge! This is called the Bonifacious Bridge built in only in 1910 CE. The best part - it has a built in seat inside it making it a perfect place to sit & watch the stream. But behold, get there as early as possible to get your solo pic or just to sit peacefully and enjoy. The place does get very very crowded throughout the day. On the other side of the bridge are the OLV Church, Archaeological Museum, Sint Janshospitaal back to back. 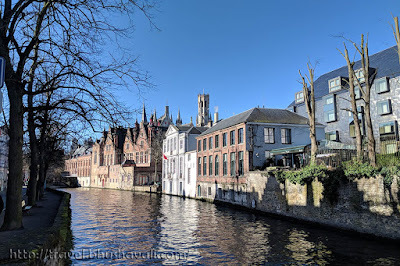 Further ahead is the Begijnhof and Minnewater, which is also considered one of the most romantic location in Bruges. There are so so so so so many swans here (yes, Atyu got to see swans for the first time too)! The park is more of a very forest-y (read: not manicured) park which is very nice. At the end of it is the Powder Tower. The other end of the UNESCO Heritage City boundary is till this. The powder tower is one of the gates of the original city wall belonging to the 11th C CE. However this tower was built in 1401 CE and was used to store gunpowder. Today accessing inside this is not permitted however it is a stunning backdrop at Minnewater. 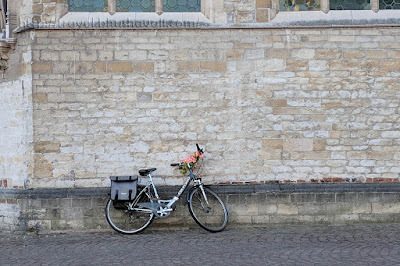 That wraps up Brugge / Bruges series and I'm be back with another place. 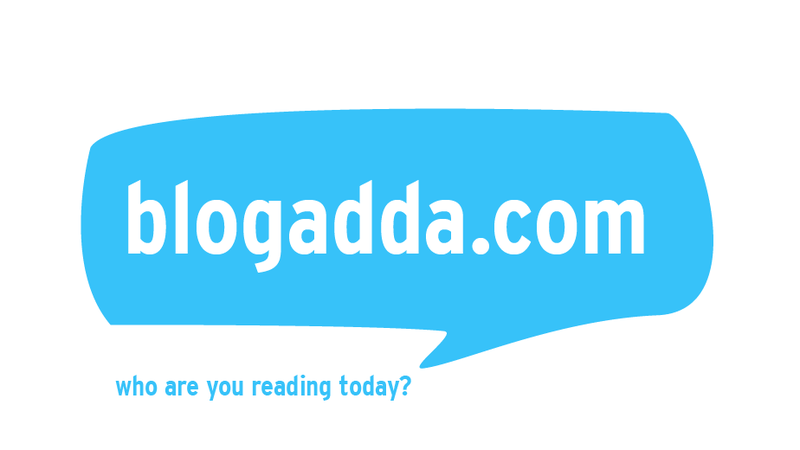 In the mean time if you're an Indian or watches Bollywood movies, all the pics above might feel familiar. The first half of the movie PK was shot here! The 2nd last pic is a still from the movie and the last pic is Atyu & me at the same location - Minnewater! What a pretty town! The park with the windmills is so beautiful and that seating spot on the Bonifacious Bridge must be amazing! Your post brought back such good memories of Brugge for me! I missed the windmills when I was there and would love to go back and see those. It's such a quaint, beautiful city. Brugges is one of the most beautiful cities I've ever visited. I'm a bit jealous of your trip however. When I went it was packed for a festival. It looks like you had the city largely to yourself. I would love to go back someday during a less crowded time. 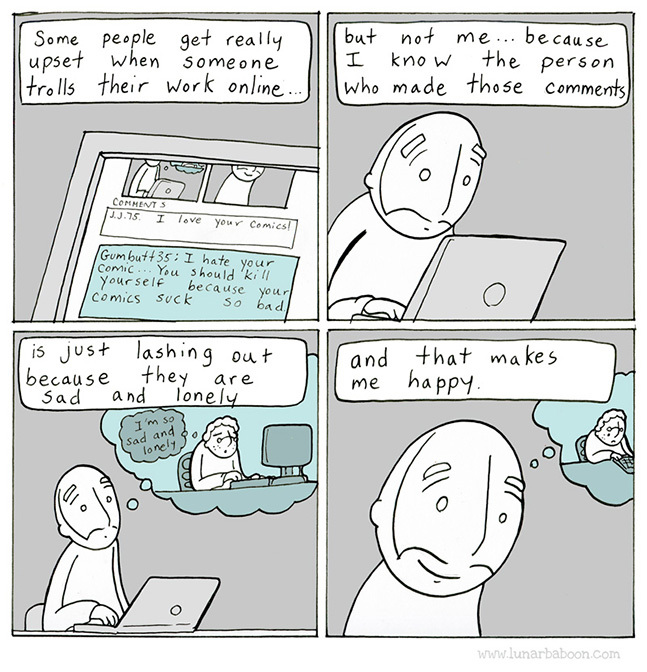 This is lovely and interesting. After all, this is not the first time I have read about Beginhof and Minnewater as one of the most romantic locations. Thus, I Will definitely include this UNESCO Heritage City on my travel bucketlist. Thank you for sharing this detailed post. 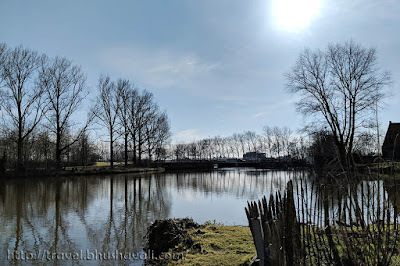 I have never realized that there are a lot to see and do in Bruges aside from Beginhof. Nice account of your visit to Bruges. Bruges is so beautiful! And tasty with those yummy waffles. It looks like you were there at the right time of year because it's so peaceful and not crowded with people. So romantic! 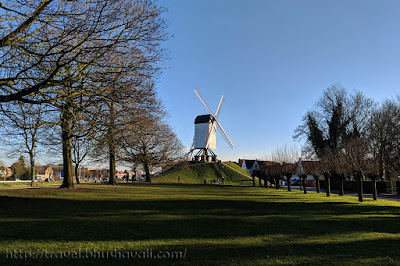 The vibrant photo of Windmill and the Lake makes me want to visit Bruges. I want to try also the waffles! 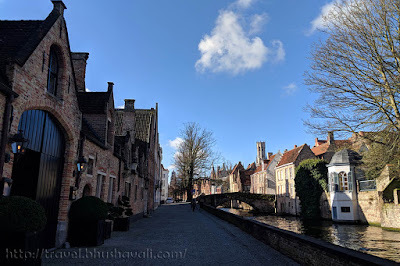 i haven't visited Bruges for years and I so want to go back after reading this! particularly to try those waffles that you mention! 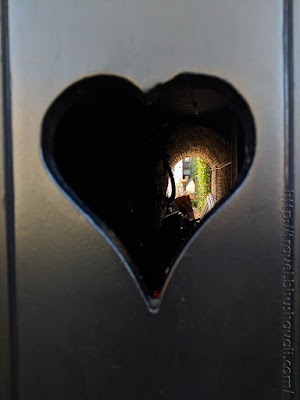 I really loved your photos of Bruges. I agree that the waffles at Chez Albert are amazing! When I went it was Belgian National Day, so we all got Belgian flags on ours. It's very cool that you got to see a windmill, but too bad that the museum was closed. The first pic won my heart. 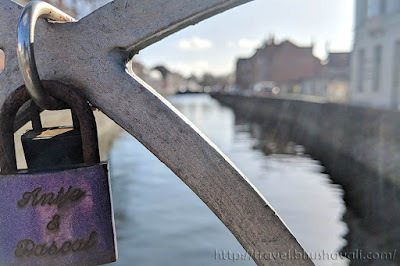 A very personal touch that is missing in most of the travel blogs these days. Also the pop culture reference was so cool. I was wondering about the place where the movie was shot. Bruges looks like a great city to sort of just wande and get lost. The waffles sound quite nice. It seems like your daughter had a great time with you there. Bruges looks like a fairytale place. I remember seeing it in one of those movies - PK I think. In someways with those canals, it reminds me of Amsterdam but a quieter version of it. Hope to be able to get here sometime. This is such a beautiful place. As I was reading the post I was in awe of the pictures. 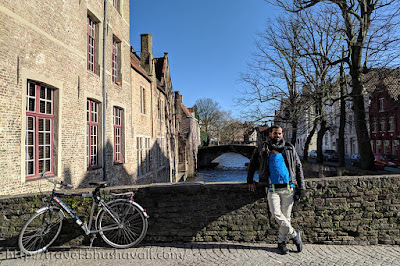 There is something really charming about Bruges, kinda like a soothing poetry. Definitely worth a visit. Can see why you'd hold this place dear to your heart. It's so charming and glad to hear this trip was more slow-paced so you could really experience and enjoy all these beautiful sceneries!